Today's Turkish elections are occurring in a political environment transformed by the Gezi Uprising. Today, 550 members of the Turkish national assembly (TBMM) will be elected. President Recep Tayyip Erdoğan and his Justice and Development Party (AKP), which have taken the country in both an Islamist and neoliberal direction, are seeking a commanding majority. If the AKP secures enough seats, Erdoğan will push for constitutional change that would transform the Turkish political system from a parliamentary government into a presidential one, granting him sweeping executive powers. On the Left, the Peoples’ Democratic Party (HDP), an alliance of Kurdish and leftist Turkish parties, is seeking to stand in his way. They hope to reach the 10 percent threshold needed to enter parliament and thwart Erdoğan’s program. Jan Ronahi and Alp Kayserilioğlu have been in Istanbul interviewing several left parties and organizations for Jacobin. The discussions cover a range of topics, including the Gezi Park protests, the battle in Kobanê and elsewhere in Kurdistan, the upcoming elections, and the prospects for the Peoples’ Democratic Party. Here Ronahi and Kayserilioğlu interview Doğan Ergün of the People’s Communist Party of Turkey (HTKP), an organization founded in 2014 out of a split within the Communist Party of Turkey. Jacobin is also pleased to publish the pair’s conversations with members of Başlangıç (The Beginning), a socialist organization, and Toplumsal Özgürlük (Social Freedom), a Marxist-Leninist party initiative. The views expressed by the respective organizations are divergent and sometimes controversial, but they are published here to allow readers a glimpse inside the Turkish left. Who are you and what kind of organizing are you involved with? I am a member of the central committee of the People’s Communist Party of Turkey. I am also a member of the editorial board of the party’s news website and magazine ileri!, as well as the theory journal Komünist. At the moment there is no Communist Party of Turkey. The HTKP was founded in 2014 after a split within the Communist Party of Turkey (TKP), as a result of a split that occurred after the Gezi Uprising in 2013. However, the HTKP sees itself in the tradition and as a successor of the TKP, which was founded as early as 1920. We also believe that the split within the TKP is temporary and that there will be a united TKP again in the future. We do have several sections and organizations such as a student’s organization, a working-class organization, and a women’s section. The party supports the Federation of Debating Societies (FKF), is a member of the United June Movement (BHH), and active is on several fronts and within unions. Concerning ideology, you know that the Turkish socialist left divides into those that support a national-democratic revolution and those that aim for a socialist revolution. Those advocating a socialist transformation defend the idea that there already was a bourgeois-democratic revolution in Turkey and that capitalism is developed. In relation to Turkey, we defend this program of socialist revolution. This means that the mobilization of the working class is central to us, but not sufficient in itself and we have to mobilize in other movements, as well. Of course, elections, unions, and the like are legitimate and necessary means and instruments for us and our purpose, but we should always focus on the perspective of revolution. And since we live in the era of imperialism, the socialist revolution to come has to be anti-imperialist in character as well. So we don’t think that a democratic revolution is necessary. We especially disagree with the notion of most of the democratic revolutionaries that there should be some kind of decentralization or devolution or federalization of the state since what we need is a central state structure. We think that the reactionary jihadi movements and imperialism are two of the central problems specific of Turkey. It is the reactionary jihadi movements that have posed a threat to democracy since the foundation of the Turkish Republic, and socialists have to defend secularism against this threat in order to defend democracy. Against imperialism and neoliberalism we have propose patriotism. Here we think that nationalism is an ideology of the dominant class. But patriotism is an ideology of the working class itself which also transcends the working class. If we have a look at Cuba or at Venezuela we can see that the peoples have developed some kind of patriotism against imperialism. In Europe, the prevailing perception is that with the eviction of the Gezi Park occupation, the movement is all but dead. Do you agree with this perspective? What do you think about the developments within society since Gezi — especially concerning the socialist left in Turkey and the AKP? Let’s briefly look at the history. The 1960s and 1970s were a period with a strong socialist left in Turkey. With the military coup d’état in 1980 the socialist left, was smashed and a new era began in Turkey. It was Gezi which ended this thirty-year historical period. And if we take a closer look, we can say that even before Gezi, since 2009, there was increased mobilization, resistance, and struggle in all social fields such as at universities, at workplaces, in communities against gentrification, and in ecological and peace movements. If we want to better grasp Gezi we have to point to three things. First of all the current world economic crisis since 2008–9 has, among other things, led to steadily worsening and insecure working relations — precariousness and poverty became a normality. This has led to massive discontent among laborers, also in Turkey. Gezi did not explicitly defend the economical and political rights of the working class, but it was an expression of the discontent of the working masses created by these economic conditions. You cannot understand Gezi if you don’t apply this perspective. Second, there is the problem of freedom and secularism. The people were increasingly confronted with the authoritarian, repressive, and anti-secular attitude of the AKP, interventions in everyday life along the lines of Islamist principles grew. In this respect, Gezi was also an uprising against Islamization and in favor of secularism. On top of it, the AKP war politics in relation to Syria was, especially for the Alevi minority, a decisive reason for turning against the governing party openly. Third, we have to understand that the Gezi/June Uprising was part of the crisis of the AKP and in effect deepened it. For quite some time now the AKP has had to struggle with several domestic problems and the very fragile economic situation of the country. 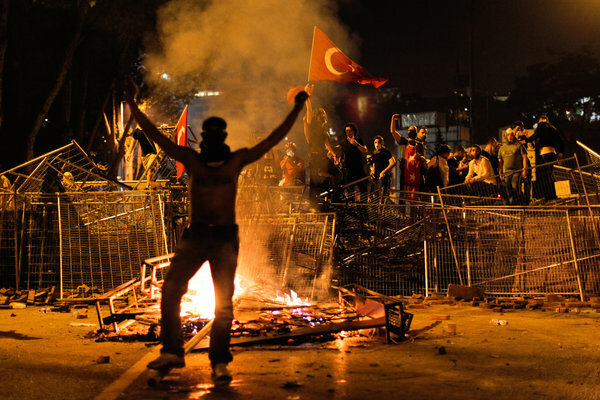 With Gezi the power of the AKP within society has ultimately been broken and the end of the AKP was initiated. Don’t get me wrong: I don’t think that the AKP will necessarily be smashed in the upcoming elections, that the AKP will fall by itself. On the contrary, I think that the question of how and when the AKP will fall is very much a question of politics. The only thing that I wanted to point out is that a historical period that existed since 1980 and the AKP itself have come to an end with Gezi. And even if the AKP falls in 2020, the Gezi/June Uprising will be one of the main reasons for that. The Turkish Republic entered a new historical period with the military junta of the 1980s. It was marked by a neoliberal, anticommunist, repressive, and anti-secular consensus. The AKP is a child of this time but, after the June Uprising, a new period is now in the making. Regarding the Left, let me tell you this: before Gezi we debated with a lot of other parties and movements. We have always pointed out that the situation which I just sketched out generated a massive discontent within Turkish society and that this discontent is the source of a dynamic within Turkey. We also pointed out that this discontent will eventually explode one day. Many parties and movements thought that the core dynamic in Turkey would come from the Kurdish liberation movement. However with Gezi we have seen that this is not the case and that there are also several other forces at play. Of course, with Gezi the people changed. I’ve seen many people who said well, you told us all of this before and we didn’t believe you, but now we see that you were right. That being said, we couldn’t anticipate the scope of the discontent in the June Uprising and consequently we couldn’t react appropriately. We couldn’t adapt to the new forms of struggles, couldn’t develop the means and tools with which we could have become part of the struggles in a meaningful manner. However this is not very surprising. Since the 1980s the socialist left was always on the defense. Indeed, we were able to analyze and also to comment on things really well, but we weren’t able to actively intervene in society and politics, specifically not in practice, as we had been able to do in the 1960s and ’70s. Thus, Gezi made it abundantly clear that the socialist left in Turkey is not ready yet and is still lacking the necessary means and tools to become a mass force. Our task now is to develop these tools and means and internalize the new discourses since Gezi, the new generation of young people, the language, and all the dynamics. We have to make an effort in making the people organize in assemblies and councils in different spheres of life, such as in neighborhoods and places of production. We are the vanguard of the struggles, but the struggles have their own dynamics and communists should seek to further these struggles. There are of course also organizations within the socialist left in Turkey that do not want to understand these new post-Gezi dynamics. Contrary to Erdoğan’s statement that Kobanê was about to fall, the city resisted the invasion of ISIS and the al-Qaeda branch Nusra Front. What consequences does the battle of Kobanê have for the socialist left in Turkey and the upcoming elections in June? We always defended the resistance in Kobanê and took to the streets for it. While we do not think that what is going on in Rojava should be called a revolution, we nonetheless think that it’s very important. We analyze, comment, and support Kobanê and Rojava, but we also hold the opinion that what is happening there is intrinsically related with the AKP politics and imperialism in general. We do believe that the Arab, Kurdish, and Turkish working class should advocate the defense of Kobane along anti-imperialist principles. So if we look at the Middle East, we can see that imperialism could exert a certain amount of control over it in the 1970s and ’80s. Now imperialism is not capable of doing that any longer, and chaos is reigning. The imperialists aren’t able to invade Iran, and they haven’t been able to make Assad fall as of yet. In this complex situation, the Kurds, the AKP, and many other forces try to realign their positions and powers. The Kurds here try to gain and strengthen their own position but there are also major differences within them. For example, Masoud Barzani is strongly associated with US imperialism while the Kurdistan Workers’ Party (PKK) follows a much more independent political line. We do defend the sovereignty of Syria and we support the struggle of the Kurds and the struggle against the jihadists, but we think that none of these problems can be solved with the AKP. That’s why we always tell our Kurdish friends to stop negotiations with the AKP. Concerning the impact of Kobanê, the struggle for Kobanê decisively affected the process of the Kurds becoming a nation. We can say that now the Kurdish nation has been fully forged with a common perception of history, a common struggle, and a common enemy. On the other hand, the rise of the HDP is of course intrinsically related to the victory in Kobanê and has given the Kurds a strong self-consciousness. It was the battle against ISIS that influenced Turkish society deeply. We are, of course, open to all kinds of common struggles and fronts, but we think that the priority for us Turkish socialists has to be the construction of our own strong, popular, and independent socialist movement with a perspective for the entirety of Turkey. In your opinion, do the parliamentary elections have any significance for the Turkish left and the society in general? In what kind of atmosphere do they take place? The upcoming elections are amongst the most important elections in the entire political history of Turkey. Think of Erdoğan and the AKP as a cyclist: if you stop cycling the bicycle stops and you fall. If you don’t want to fall, you keep pedaling. The AKP cannot hand over the power to somebody else, because of its role in the Syrian war and the crimes it has committed. The AKP will and must try to remain in power by all means necessary. The AKP will continue to pedal. We now experience the labor pains of a transition into a new historical period and we should fight for this transition. We, of course, could not line up in the elections as the Communist Party of Turkey since there is no TKP anymore. And we also didn’t want to join the elections on our own, merely as the HTKP, but we wanted to join the elections within the framework of a larger, independent alliance. Since we didn’t succeed in constructing such an electoral alliance, our priority now is to contribute to the fall of the AKP. Not only through elections but also through struggles. You know, there is an argument within the socialist left which goes like this: the AKP is falling anyway, not even the imperialists support the AKP anymore. We now have to concentrate on what’s next after the AKP period. I can understand this argument, but it shouldn’t make us refrain from fighting against the AKP because imperialism and the Turkish bourgeoisie still need the AKP — there is no alternative for them yet. Imperialism, as well as the Turkish bourgeoisie, would prefer a more domesticated AKP. And that is why it is still important to actively fight against the AKP and make them go down. Because whoever forces the AKP to go down will also play a significant role in determining the future of Turkey. Following this credo — that now the priority is to defeat the AKP — we agreed to support progressive candidates from the HDP as much as from the Republican People’s Party (CHP). We cannot support the entire program of the HDP nor the one of the CHP, so we cannot support both parties as such. But, as I said, we agreed to support progressive candidates from both parties. Whatever the election results, be it a victory or a defeat of the HDP, the situation after the elections will be chaotic. Because the AKP will again, independent of victory or defeat, use all means necessary in order to hold on to power. The Peoples’ Democratic Party seems to be a popular, leftist force that could breach the 10 percent electoral threshold and gain seats in parliament. What is the HDP? There are voices that already claim the HDP could be the Turkish version of Syriza, what do you think about this comparison? Some think the HDP is a socialist organization. But the HDP is more of a leftist party stemming from a national liberation movement. Within the party there are also anti-secular elements, landlords, and other rather disagreeable persons. And since the HDP is the political expression of a program of national liberation, we cannot support the HDP just like that. Of course, there are very progressive elements in the election manifesto, but there is no focus on class and on the relations of production. The program is, at many points, pre-Marxist or rather post-Marxist and utopian. There is a structural similarity with Syriza and Podemos. All these parties are rooted in the current capitalist crisis and the power vacuum that originated from it. The parties of the status quo are not able to fill this vacuum anymore and that’s what Syriza and Podemos try to do. However, it is not yet clear if these parties will adopt a stance of representing and defending the interests of the working class. Currently, you can follow the trajectory of these parties with Syriza. Syriza is now facing a series of crucial decisions which will determine for whose interests this party will stand. But as I said, I think it’s not yet decided whose interests these parties will stand for — this is the case with Syriza, Podemos, and the HDP. This will be determined by the decisions these parties will make in crucial moments. It will then be clear if these parties have a progressive function or not. Whatever the case, it’ll be the task of the communists to further the struggles. Relating more specifically to the HDP, one should point out that since the socialist left was smashed after 1980 and since the formation and development of the PKK in the 1980s, there has been an unequal relation between the Turkish left and the Kurdish movement. That is since then, the Kurdish movement has always been much stronger than the Turkish left, which had and still has some negative consequences such as some Turkish socialist organizations dissolving themselves within the Kurdish liberation movement and forgetting about their own tasks. But now, since Gezi, we are in a situation that enables the Turkish left to organize itself into an independent socialist front — which the HDP cannot do and shouldn’t try to do, precisely because the HDP is the political expression of a leftist national liberation movement. Not before the Turkish socialist left develops an independent expression, fights its own battles, and the power relations between the Turkish movement and the Kurdish movement become equal will there be any meaningful relationship and cooperation. More specifically, there are two important points regarding the HDP which we criticize. First of all, they defend a program of radical democracy which, amongst other things, involves a decentralization of the state. We reject this idea. In a similar manner, we part ways concerning the evaluation of the Turkish Republic. We think that it doesn’t make any sense if you reject the achievements of the bourgeois revolution in Turkey. We also criticize Mustafa Kemal Atatürk and Kemalism, but we also see the achievements that were established with the revolution of Mustafa Kemal, such as the anti-imperialist struggle and secularism. But still: any political strategy in Turkey must encompass Kurds as much as Turks — any exclusionary approach will fail. It is important to construct the solidarity of the Kurdish and Turkish peoples. Doğan Ergün is a member of the People's Communist Party of Turkey. Today’s Turkish elections are occurring in a political environment transformed by the Gezi Uprising.